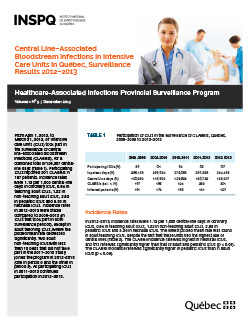 From April 1, 2012, to March 31, 2013, 67 intensive care units (ICUs) took part in the surveillance of central line–associated bloodstream infections (CLABSIs), for a combined total of 128,207 centralline days. Participating ICUs reported 201 CLABSIs in 197 patients. Incidence rates were 1.13 per 1,000 central-line days in coronary ICUs, 0.84 in teaching adult ICUs, 1.22 in non-teaching adult ICUs, 2.83 in pediatric ICUs and 5.36 in neonatal ICUs. Incidence rates in 2012–2013 were stable compared to 2008–2012 (in ICUs that took part in both surveillance periods), except in adult teaching ICUs, where the pooled mean rate decreased significantly. Two adult non-teaching ICUs with less than 10 beds that did not take part in the 2011–2012 study joined the program in 2012–2013 (one in period 6 and the other in period 9). All participating ICUs in 2011–2012 continued participation in 2012–2013.